The most universal and easily recognized buddhist symbol is the image of the Buddha seated in meditation. For many buddhists, the image represents their greatest aspirations, ideals, and potential. For others, it exemplifies the deep inner peace and contentment they find in Buddhism; thus, they are drawn to an image that symbolizes calm and peace. Buddha images have long conveyed the teachings of the Buddha. 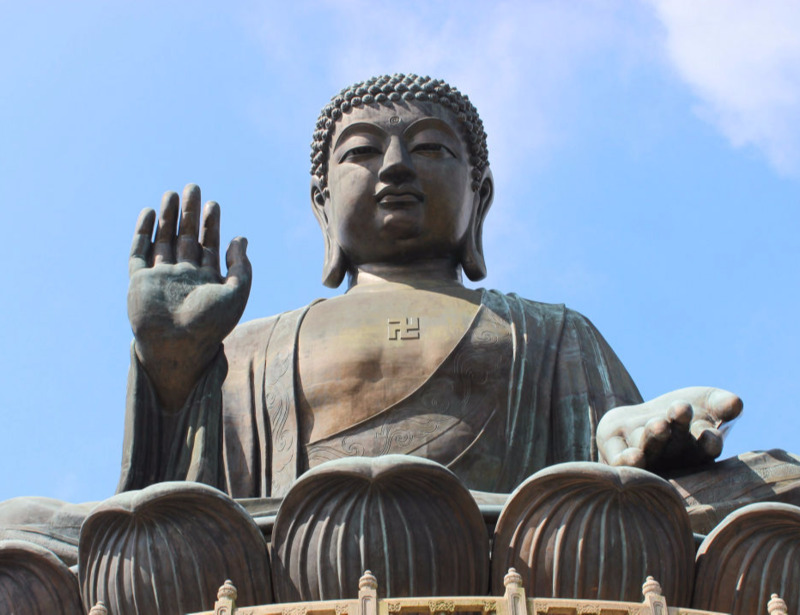 Some of the core principles of buddhism are taught through the symbolism found in Buddha images. Different buddhist traditions conveyed different symbolic teachings through the various images. The images depict a range of emotions, gestures, and states of mind that may awaken meaningful inner states for those who see it. However, Buddha images are not just symbolic in value but represent qualities and instructions that are cultivated with buddhist practice. By emulating the posture, gesture, and appearance of Buddha images, we nurture the best of human qualities to develop. The following are images of the most commonly worshipped Buddhas and Bodhisattvas and the meaning conveyed in each image. Amitābha is the Buddha of the Western Pure Land of Ultimate Bliss. He is one of the most widely worshipped buddha of the Mahayana tradition. Buddha Amitābha is also known as Amitāyus. Amitābha means “limitless light” and Amitāyus means “limitless life” so buddha Amitābha is also called “The Buddha of Immeasurable Light and Life.” Through single-minded recitation of his name, for as few as ten times, one may be reborn in the Pure Land of Ultimate Bliss. This method known as the Pure Land practice is described in the Amitabha Sutra. 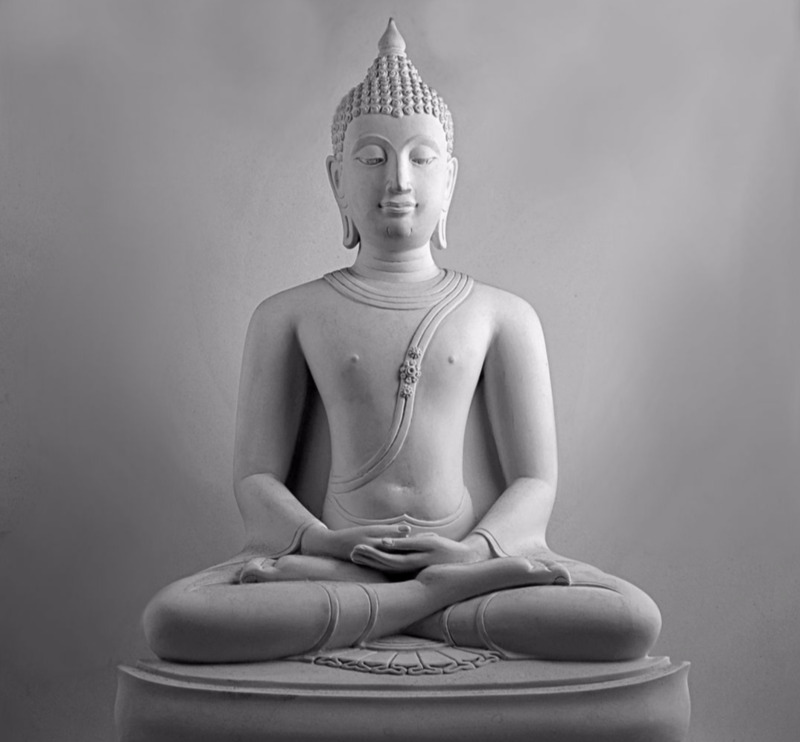 In this image, Amitābha Buddha is seated on a lotus flower with the right hand displaying the abhaya mudra and the left hand making the varada mudra. In other depictions, he is seated in meditation posture displaying the dhyana mudra with a lotus flower in his hands. In standing position, Amitābha is often shown holding a lotus flower in his left hand; his right arm is bare and extended downward with the right hand facing outward, sometimes with thumb and index finger touching, which represents Amitābha's compassion for all beings as he guides them to his pure land. In Buddhism, Maitreya is a Bodhisattva who will appear as the future Buddha, the fifth Buddha of the Worthy Kalpa (bhadrakalpa). In Sanskrit, Maitreya means "loving-kindness". He is often depicted as seated on a throne with both feet level on the ground or crossed at the ankles, waiting to become the next Buddha. The sitting posture of this Buddha image symbolizes the balance of thoughts and tranquility. The beads symbolize ‘pearls of wisdom'. The mindfulness practice of metta or "loving-kindness" is named after Maitreya. 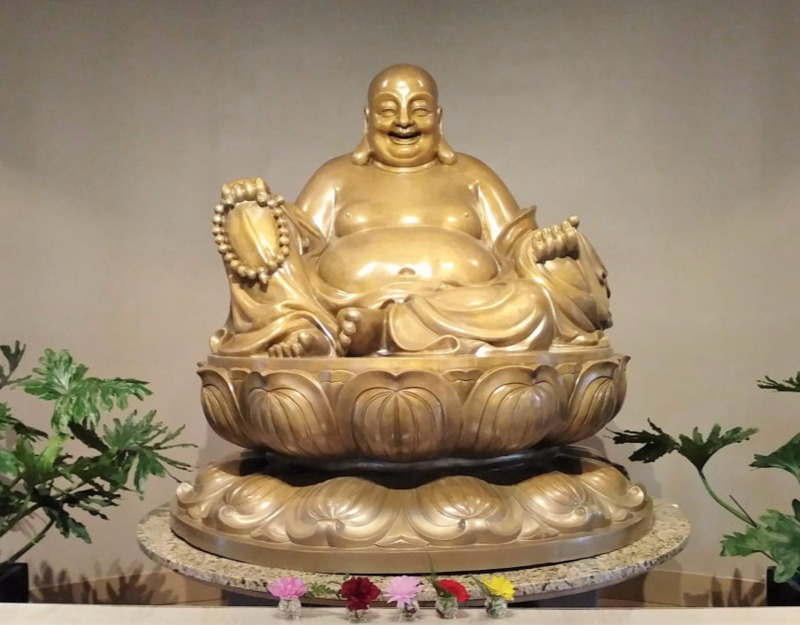 Taoism and Zen Buddhism depict him as a fat, happy monk with a bald head, wide smile, a huge exposed belly, and carrying a calico bag that represents abundance and contentment. It is said that his appearance comes from a Buddhist Zen monk who lived over 1000 years ago. In Chinese, he is portrayed as the laughing Buddha or lucky Buddha. He is often depicted happily surrounded by children or with a gold nugget in his hand and surround by an abundance of gold coins. 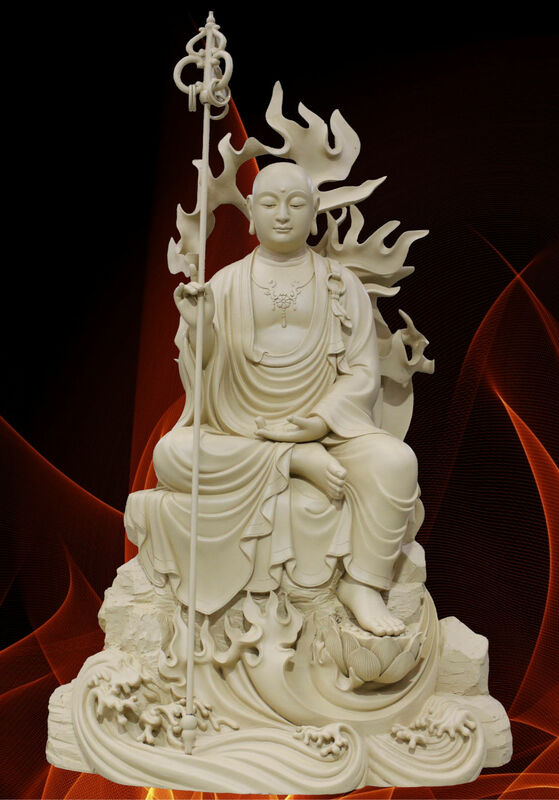 Chinese people worship and pray to Maitreya Buddha to bestow luck, wealth, happiness, and children. 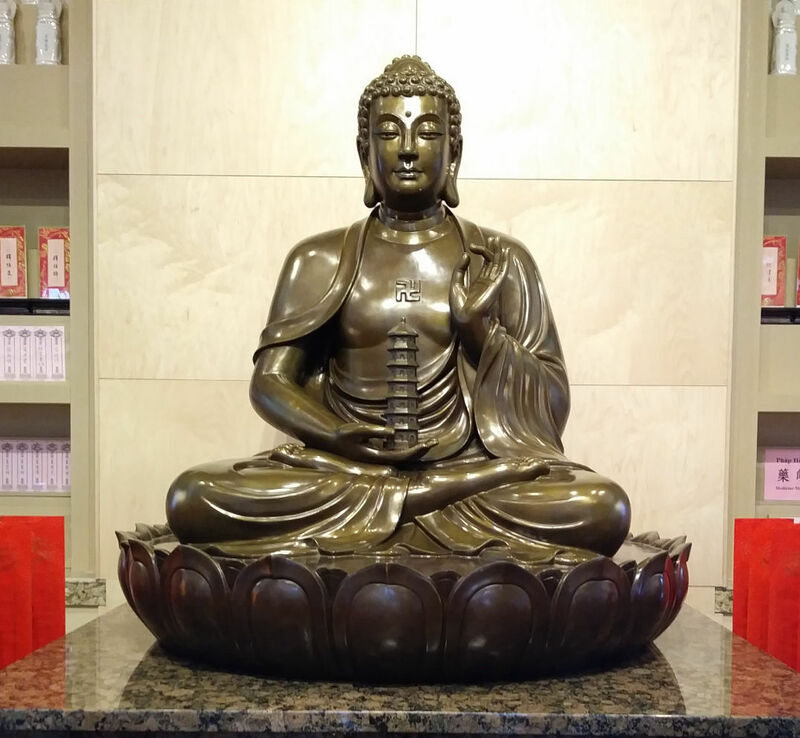 Medicine Master Buddha, Bhaiṣajyaguru in Sanskrit, is the Buddha of healing and medicine in Mahayana Buddhism, curing suffering with the medicine of his teachings. His twelve vows and mantra to eliminate suffering and afflictions of sentient beings are described in the Medicine Master Sutra. He is also the Buddha of the eastern pure land of "Lapis Lazuli." He is typically depicted seated, wearing the robes of a Buddhist monk. He holds a medicine jar in his left hand and rests the right hand on his right knee, holding the stem of the Aruna fruit between thumb and forefinger. In Chinese depictions, he is sometimes holding a pagoda, representing the ten thousand Buddhas of the past, present and future. In Tibetan Buddhism, he is usually depicted having blue skin. Shakyamuni Buddha may be depicted in different postures to illustrate different events in the Buddha’s life. The most typical is the meditation posture with the legs folded in Vajra (lotus) posture and performing the dhyana mudra. The back of the right hand rests on the palm of the left hand, sometimes holding an alms bowl. The mound on top of the head symbolizes the highest wisdom. The white dot (urna) between the eyebrows represents the ability to see reality beyond the ordinary vision of people. The long earlobes are from the weight of the Buddha’s princely earrings, now missing since he renounced the worldly life. A gentle, subtle smile indicates inner peace and true happiness. Long arms symbolize nobility. Long, slender fingers signify mindfulness, precision and purity in every act. Round heels represent an even temperament, and fine webs between toes and fingers convey interconnectedness. Earth Store, Kṣitigarbha in Sanskrit, made a vow to not achieve Buddhahood until all hells are emptied. He is often depicted as a monk wearing a crown, donned with red sash, and seated on a lotus in the midst of fiery flames. One of his vows is to help beings suffering in the hells and evil destinies. His vows and how he benefits all beings is detailed in the Earth Treasury Sutra. He is also regarded as guardian of children in Japan. Here, he appears in the form of a monk with one foot resting a multi-layered lotus pedestal. He is surrounded by a flaming jewel and cradles a wish-fulfilling pearl in his left hand and a ringed staff with the right hand. The sound of the rings warns crawling creatures of one’s approach lest they be stepped on. Other standard symbols are the third eye and elongated ears. 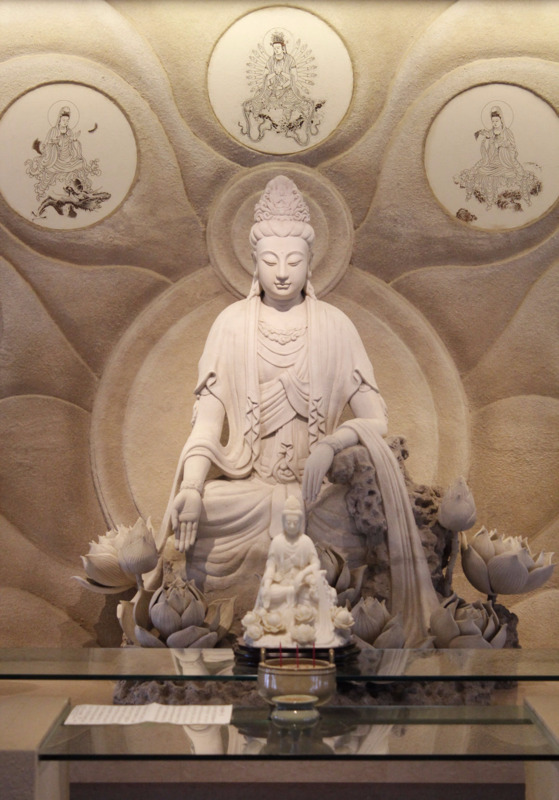 Guan Yin, Avalokiteśvara in Sanskrit, is the Bodhisattva of great compassion and appears in more forms than any other Bodhisattva, sometimes male and sometimes female, or any form that might be beneficial to living beings. The Universal Door Chapter of the Lotus Sutra describes the various ways in which Guan Yin helps living beings and the thirty-three different forms in which he appears. In this image, Guan Yin is depicted seated gracefully and at ease on a throne of lotuses, looking or glancing down, symbolizing that Guan Yin continually watches over and contemplates the world. He is holding the abhaya mudra that symbolizes giving blessings, peace and protection. Pictured above Guan Yin are different manifestations of the Bodhisattva, such as Avalokiteśvara with many hands and eyes. Mañjuśrī is the Bodhisattva of great wisdom. He is depicted as a male Bodhisattva wielding a flaming sword in his right hand, representing the cutting off of ignorance and duality. In his left hand, he holds the Prajnaparamita Sutra, representing his attainment of ultimate realization. Mañjuśrī is usually shown riding on a blue lion, representing the use of wisdom to tame the mind, which is compared to riding or subduing a ferocious lion. In Japanese art, Mañjuśrī'sword is sometimes replaced with a ruyi scepter, resembling a long curved lotus stem. Universal Worthy (Samantabhadra) Bodhisattva is most well-known for his ten great vows. His conducts and vows are described in the Universal Worthy Bodhisattva's Conduct and Vows Chapter of the Avatamsaka Sutra. He represents the virtue in principles and conduct, corresponding to Mañjuśrī Bodhisattva’s virtue in wisdom and righteousness. The two Bodhisattvas are the right and left assistants of Shakyamuni Buddha. Together, they are referred to as the Three Avatamsaka Sages. 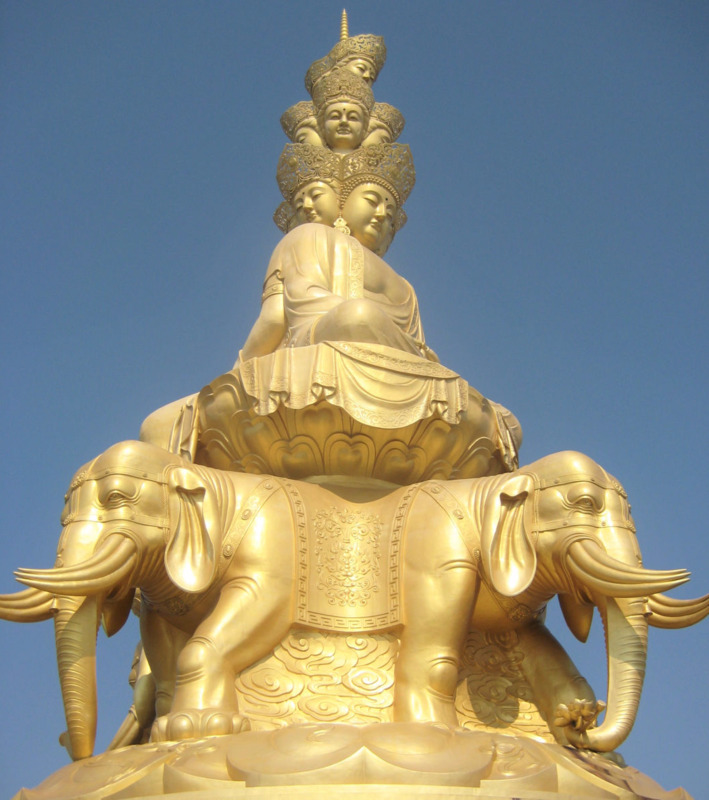 Universal Worthy is on the right side of the Buddha, represented as male or female, riding a white elephant with six tusks, and carrying a lotus leaf, or a wish-fulfilling scroll.